Croydon, in South London, is having a major makeover, a £5.25bn regeneration programme which will include 20 construction sites. To aide the smooth implementation of this huge programme, Central Government, Croydon Council, the Greater London Authority and Transport for London have partnered to finance and deliver a series of interventions, from transport links to energy, from smart city initiatives to social infrastructure facilities. One of the main concerns of Croydon Council is the effect of all this work on the air quality in the area. With so many developments using construction machinery and generating increased construction vehicle traffic, one of our key priorities is to understand their impact on air quality in their surroundings to anticipate and control pollution peaks in a proactive way. However with very little if any data available on construction site related air pollution, we needed to find a solution to collect quality data that would help us and our partners take preventative rather than remedy actions to reduce exposure to air pollution. At the same time Digital Catapult was planning an innovation programme for local authorities to encourage them to use the LoRa network (a Low Power Wide Area Network, especially suited for IoT connectivity). Croydon Council became one of four Local Authorities involved in the programme and in spring 2018 an engagement exercise started with companies interested in providing monitoring services. In June, they all pitched at Digital Catapult HQ. 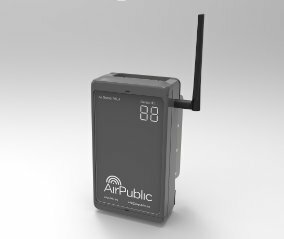 AirPublic was delighted to be chosen as the supplier of monitoring equipment. It was excellent timing; we had just completed the accelerator programme at Bethnal Green Ventures, and we were able to invest their seed funding into redesigning and manufacturing V0.4 of our SensorBox; more sensors inside and a slicker weather-proof case. After a period of calibration we installed our devices on lamp posts and inside perimeter walls of construction sites. We added features to our dashboard, including a wind rose and soon an alert system. a first iteration of a dashboard showing live data is being tested by our pollution and construction logistics teams, and an alerts system for when levels exceed acceptable levels of pollution is now being iterated. Once we get more data history, we will be able to analyse it, whilst taking into account more of the context of onsite activity. This will help us understand the impact of construction sites at different stages of development, from demolition to construction, with the aim to provide reliable evidence to support future planning negotiations and the development of sustainable construction practice. We are still in the early stages of our pilot. There are already many lessons learnt and we will be capturing them and sharing more on them, and our progress and findings, as the pilot unfolds. Our thanks to Marion Cugnet at Croydon.digital, Linda Johnson and Alex Polkington at Croydon Council for ensuring a successful launch of the project. Thursday signalled the end of AirPublic’s involvement in the OrganiCity project after four months of experimentation and co-creation. Together, with nine other London based experimenters, we have put OrganiCity’s nascent urban tech tools to the test and provided a rich and in-depth feedback to the OrganiCity tech team on where and how the OC platform can improve to better suit systems such as the AirPublic sensor network. The OrganiCity project is an interesting and timely intervention, in an urban-tech ecosystem largely dominated by the IoT superpowers of Cisco, Amazon, IBM etc. OrganiCity is concerned with the future development of the urban technology ecosystem and the media (or mediums) through which we interact with the city in the coming decades. As Belen Palacio, project lead for OrganiCity in London, mentioned at Thursday’s event, previous visions of these ideas came in the form of ‘corporate dashboards’ — corporate conglomerates imagined a future of vast banks of control computers, knobs and dials and a central command and control system for the future city, akin to Chile’s 1970 Project Cybersyn. As these ideas, and technology, have proceeded apace, the reality of these future cities is increasingly clear and resemble less a hierarchical command and control structure, and more a broad and complex array of If This Then That (IFTTT) algorithms. If the level of air pollution is high on street x, then alter traffic flow to prevent buildup and recommend cyclists and pedestrians an alternative cleaner route. If tube line y is offline, then prioritise automatic redistribution of public hire bikes to compensate travel options, etc. The key here is, as Belen advocated during her talk, the value of developing these processes together, with the citizen and the urban dweller as central to the design process of these new systems. We all know what bad design looks like and what it’s capable of. OrganiCity is about experimenting at scale with new city tools and processes and designing with the citizen in mind, first and foremost. To view Belen’s presentation slides, see here. Mapping air quality in central London. Each coloured circle represents a location which has been repeatedly measured, at least 20 times, in a short period of time. Air quality is represented from Green to Red, Low to High pollutant counts. Each spot represents a 20m x 20m area. Obfuscated visualisation showing the breadth of the AirPublic experiment. Green areas have good coverage. John gave an in-depth breakdown of feedback on AirPublic’s use of the OrganiCity platform and its constituent parts, including Sensinact (SN), the Urban Data Observatory (UDO) and Tinkerspace. The AirPublic slides from Thursday, here, provide some more information. We’ll be writing up a public blog reporting back on our experiment in full in the next week or so. Our final speaker, Fabrizio Dini, from traffic monitoring startup TrafficFlow, gave an overview of the trajectory of TrafficFlow’s work and their progress as part of the OrganiCity project. In London, they placed three traffic monitors, in Hoxton Square, on Bethnal Green Road and another at the Open Data Institute — in addition to another 10 in Florence, Italy. Fabrizio gave an in-depth overview and analysis of the data they have collected over the last four months, including an impressive breakdown of traffic data on London roads into their constituent parts — pedestrians, buses, cars, bicycles etc- all produced from a simple monitoring kit the size of a Raspberry Pi. TrafficFlow monitoring platform placed in Newspeak House, Shoreditch. For the last part of our evening, we broke out into groups and provided an opportunity for participants to feed back on what they’d seen and heard regarding the experimenter projects and, more widely, the OrganiCity project as whole. Thanks again from the whole AirPublic team to those who attended. If you’d like to view the slides from Belen you can find them here, and the slides from TrafficFlow & AirPublic, here. We’ll be releasing a public report blog on our progress as part of the OrganiCity project over the next week. You can find out more about the OrganiCity project here, including registering your project for the next Open Call.